This little guy steals my heart, every time he poses for a picture. His smile brightens a room and his laugh makes you laugh with him. He is incredible. 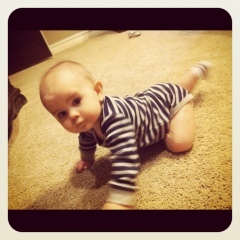 Now he is also mobile, perfecting the scoot and practicing the crawl. So thankful for two healthy kiddos. And thankful that this one is my son! So two things. 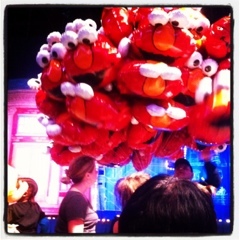 First we had a great time at the sesame street live "Elmo's World" tonight. 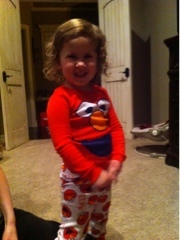 "Elmo" even brought Ellie some new pjs and a rockin Grover microphone. (definitely beats the $10 balloons they sold there) She was just a little stoked about this! Second, just installed the blogger app on the iPhone, so maybe there is a chance we can update this thing more often. Here is a glimpse of the Sutton's newborn photo shoot. So the Sher name will live on. 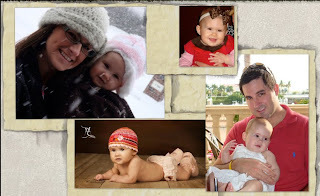 Meeting the world on July 25th, 2011 at 9:52, Mr. Sutton came in weighing a flat 8 pounds. Looking remarkably like his older sister, he stole our hearts immediately. With the help of KK and Grandmommy, as well as all of our wonderful friends that came to visit and provide us dinner for over two weeks, we are back at home and adjusting to being a family of 4 (I mean 5 with Petie). As far as the name goes; with a dog named Petie and a son named Sutton, one would think our family was a bunch of hicks...I mean aggies...I mean pokes. But the reality is we just liked the "ring" to it...even if Coach Sutton has never won a championship ring for himself! James, of course, is derived from Heather's dad, James Charles Hill, who although is not here to enjoy the diapers and spit up, is indeed still very much a part of our lives. 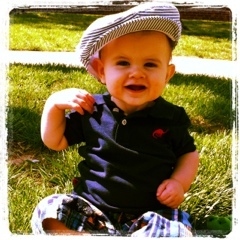 We are excited to carry his memory through our little boy! 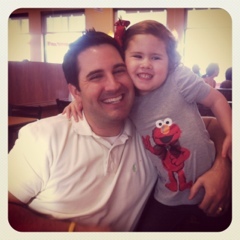 For the record, Sutton was Sooner Born and will be Sooner Bred! As all little boys should be. Now that we are back in the spirit of blogging, we needed to make our most exciting news a blog entry! 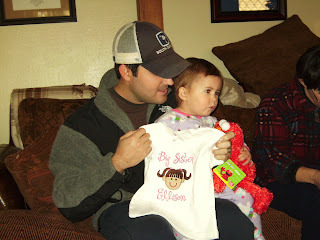 That's right- Ellison will be a big sister at the end of July! Rob and I could not be more excited that our family is growing and are looking forward to watching Ellie as she enters into this new phase. There had already been lots of talk about "babies"with Ellie as our dear friends Brad and Ashley and Emily and Rob are expecting in May so we have been praying for baby Cunningham and baby Garrett for months and talking about their new additions. Needless to say "baby" is a popular word in her vocabulary. With all of our family in town for Christmas, we got to share the big news with them on Christmas day. We never cease to be amazed at how God plans accordingly, and surrounds us with friends to encourage, support and celebrate life with. Now, we are eagerly trying to sell our home, as our new home should be ready come late March. I am thankful we took the leap of faith to build this new home before knowing we were going to need the space so soon.